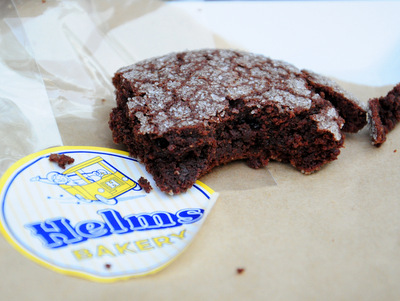 The Helms Bakery was a southern California fixture for decades, from 1931 to 1969. Their slogan was “Daily at Your Door” and their products were delivered throughout southern California by delivery wagons packed with fresh loaves of bread, donuts, cookies and cake. Their main facility was in Culver City, Los Angeles and is still a landmark for the area, now hosting a number of restaurants and stores in what is known as the Helms Bakery District. The building hasn’t housed a bakery for decades, but that is about to change because pastry chef Sherry Yard and Sang Yoon (who recently appeared on Top Chef Masters) are reopening the official Helms Bakery in that space. The bakery itself – which will sell all kinds of pastries and breads, as well as Helms’ signature donuts – isn’t scheduled to open until early next year, but you can get a sneak peek by heading down to the Helms Bakery building to visit the Helms Bakery Truck. Sherry confirmed to me the other day that the truck was open Thursday – Sunday, from 12-4 pm. And I could not wait to get down there and check it out. The delivery truck is stationary at the moment, but the 1962 wagon has been completely restored and does run. It is set up exactly like the original deliver trucks, with wooden drawers in the back that are full of goodies. The day I visited, the goodies included freshly baked cookies and ice cream bars, and I couldn’t resist trying a few different things. 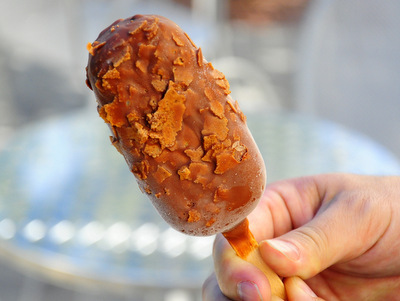 I started with an ice cream bar that was made with roasted banana ice cream, dipped and chocolate and rolled in feuilletine, which are crunchy pastry flakes that pastry chefs work with to add a little texture to a dessert (kind of like an ultra thin cornflake). Chocolate and bananas is a delicious combination and this was no exception. 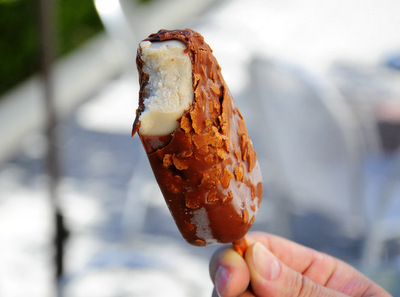 The ice cream was delicious and full of banana flavor, and the chocolate shell was ultra-thin with a perfect snap to it as you bit in to the bar. 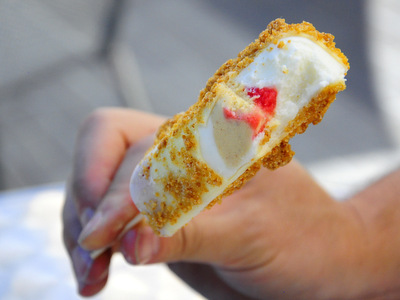 I also tried a strawberry cheesecake ice cream bar. As tasty as the banana was, this one was even better. It had three different types of ice cream inside to capture that cheesecake flavor. The base was a fromage blanc ice cream, with pockets of strawberry sorbet and graham cracker ice cream. The strawberry sorbet really popped, and the fromage blanc ice cream had a wonderful lightness to it. The bar was dipped in a very thin layer of white chocolate and finished with sweet, crispy graham cracker crumbs. It just might be one of the best strawberry cheesecakes I’ve had. 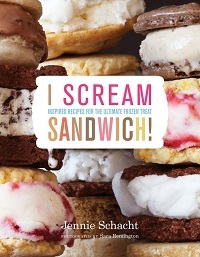 You can’t go wrong with any ice cream bars, but you also don’t want to miss out on the ice cream sandwiches. 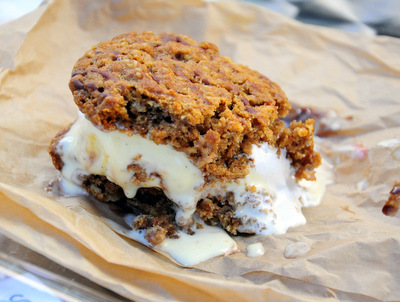 This one was built with jumbo oatmeal cookies sandwiching a fudge-swirled vanilla ice cream. In the center of the ice cream, there was a pocket of smoked marshmallow, and the whole cookie was drizzled with a little bit of chocolate. If you think this combination sounds similar to a s’more, you would be right, since that is the sense I got from the combination of smoked marshmallow and fudge as I ate. The cookies were tender and delicious, a great balance with the ice cream. My only complaint about this sandwich was that it was almost to big to fit in my mouth – fortunately, after softening for a minute or two I was able to squish it down just enough to take a huge bite. And that was followed by many additional bites. 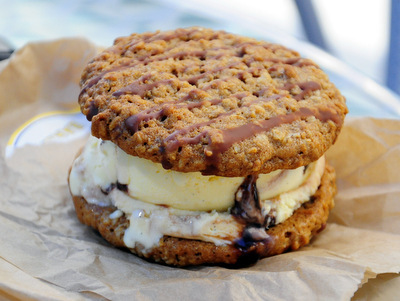 This sandwich is big enough to share, especially if you’re going to be tasting some of the ice cream bars, too. In addition to the cookies on the ice cream sandwich, they also sell individual cookies at the Helms Bakery Truck. These brownie-like cookies made with almond flour and packed an intense dark chocolate flavor. It was also so tender that it just about melted in my mouth. The prices are very reasonable. I paid $3 for each ice cream sandwich and the cookies were $1. 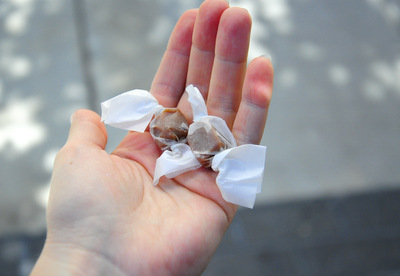 As a little added bonus, I also got a little caramel after I paid – and not just any caramel, a chewyÂ creme fraiche caramels with cocoa nibs. Nice balance of flavors and a good sneak peek at one of the candy options that should be at the bakery. 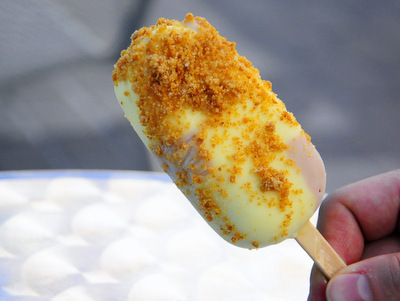 They do change up the menu a little bit now and again, but if you hit the truck before summer is over, you are guaranteed to find ice cream and you’ll have a very good chance of finding these exact same treats in stock. I would highly recommend stopping by if you’re in the neighborhood. Actually, the ice creams are definitely worth going out of your way for – and I know that I’ll be back for another round soon. I am old enough to remember buying bread and those wonderful donuts from the Helms truck in our Los Angeles neighborhood. It was just one summer after we had moved back from New Mexico and before we moved out to the suburb of Arcadia. But I swear they are the ones who created my love of donuts! 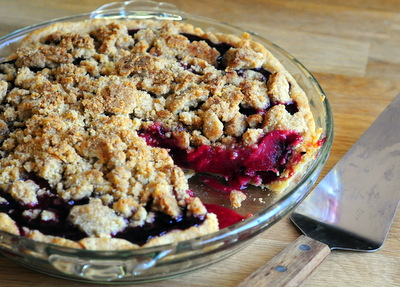 Opening those drawers of fresh baked sweets–what a wonderful aroma! Hope the new bakery has some of those wonderful donuts when they open. this is crazy, and by crazy I mean awesome – I live right by there! walking distance. I know where I’m going tomorrow. thanks! The Helms driver was so mean to us kids. I remembering begging my mom to come outside with us so he would be nice. He would slam the drawers on us and just be nasty. I have the 1:24 Scale Models of my 1931 Helms Bakery Truck (Coach) if interested. The Helms truck (Heck, maybe it’s the same one!) used to drive down my street in La Mirada. Once, my older brother Bob, then around 12 years old, flagged down the truck to buy a donut . . . and then the driver proceeded to chastise him for making him stop to sell a “five-cent” donut. Bob told my mom about the encounter, and that was the LAST time any of my family bought anything from the Helms truck! Later that year, Helms went out of business. One word: Karma! My grandfather worked at the Helms bakery for many years after he returned from service in WWII, long before he would become the mailman I knew him to be while I was growing up. I recall with advantages “Mac” and that amazing yellow truck with the wooden drawers that came to our house well into the ’70s. 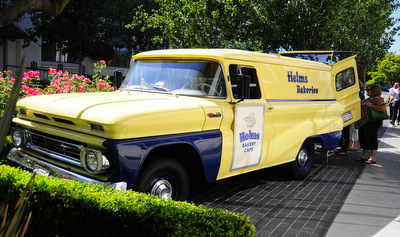 The Helms Truck was a daily fixture in many neighborhoods’ in Oceanside, CA and Camp Pendleton, CA. We are sharing many fond memories of Helm’s drivers in our town’s Remember page. I just remember all the sweet smells and tasty goodies of baked goods, candies and other treats that they provided us just outside our doors. Wish those days would have never ended. Well, some things like Helm’s. Sounds like a song, huh? Who was the man who owned and operated Helms a Bakery . We moved from Washington in 1950 to Los. Angeles n that’s when I was introduced to Helms Bakery. My grandmother looked forward to their fresh bread and glazed donuts n so did I.
I remember our Helms Delivery man was named Scotty….kinda reminded me a bit of Santa in looks. He used to give us a chocolate coated macaroon cookie on our birthday. Oh those memories! Born mid-June of 1955, as Baby Boomers growing up in the mid-1960’s, my twin brother Paul and I would spend our summer weekends at our grandmother’s house located on the corner of Cherokee and Elizabeth avenues in South Gate, CA. Hearing the Helm’s Bakery Truck’s distinctive “Helman’s Air Whistle” announcing his Wednesday presence throughout the neighborhood, both Paul and I would run frantically thru our grandmother’s house to find and beg her for enough change to buy each of us a couple glazed donuts. A fond memory that still brings a smile to my face every time. During the spring of 1963, our elementary school’s second-grade class field trip was to be a guided tour thru Helm’s Bakery Plant. Sadly, a week before the field trip event, one out of the five kids in my family managed to bring home a case of chickenpox or measles. Having been quarantined by our family doctor, we were unable to attend school for at least two, if not three weeks. Having to miss our class field trip to Helm’s Bakery was devastating. Upon returning to school, it didn’t take long before Paul and I heard from every one of the 60 plus kids who experienced the Helm’s Bakery tour, during recess or during class when each were asked to stand and tell about what they did, what they saw, each one bragging about how many and what kind of donuts each kid ate. Each kidâ€™s story growing slightly longer than the last, bragging in more detail after each telling. It was sad that we missed out on such a fantastic field trip, even sadder still is the fact that Helm’s Bakery having closed only a few short years after the tour my brother and I missed. If and when they do re-open the bakery again, I plan to be there. I might even share my story with those who would be interested. I grew up in Garden Grove, Orange County, California. A Helms truck parked at the same corner in our neighborhood and we would stop and get donuts or cookies on our way to school. Such a sweet memory! They made a cookie that was like a Milano cookie but soooo much better! Wish I had that cookie recipe. Some of my earliest memories..1953? The older, open in the middle, truck coming to sell goods. We lived on 7th street in Santa Monica…1 block from Lincoln…south of what is now FWY 10. I remember the driver giving us the stiff paper fold up color model of the truck. Then when we moved to Fresno in summer of 1961 , seeing the newer truck with the wood racks at the rear. I really liked their glazed donuts. I remember when I lived in South Gate, California as a kid loved hearing the sound of the Helms truck! We lived next to my grandma and she often bought her bread and other goods from the truck and sometimes bought us dougnuts! They were heavenly!!! Back when life was so much simpler back when people didn’t get offended by everything under the sun! Good memories!!!! Grew up in Whittier in the 50s – 60’s. Our Helm’s man was Clarence and he was a character. One of these days I will find the Helm’s recipe for Applespice donuts – they were the best!!! I remember the Helms Bakery trucks coming down our street in El Monte. Almost every morning we would run out for a doughnut before school. Nice memories of a carefree time in our lives. All we had to worry about was growing up. 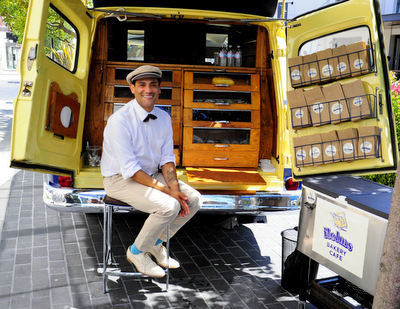 I share the same fond memories of the Hem’s Bakery truck and the man who visited our neighborhood in Fullerton. His name was Jerry. He was a kind man with obvious virtue, He was also extremely handsome–I’m talkin young Sean Connery handsome. I laugh now that I never noticed how our mothers would light up when they heard his whistle! I also remember that he was always our best customer when we had our lemonaide stand. It wasn’t just fresh bread and doughnuts, Jerry made our neighborhood safer and happier simply by being there. I remember in Brea Ca. in the early 60`s, our Helms Man was Gene Xenos, and oh how I loved him coming around, & SO MANY others too. My VERY FAVORITE item was their ” cream puffs”!!!!! The BEST I`ve EVER had!!! Sure wish one could still buy them !!!!! They were soft & creamy, not harder & so crusty. Gene was very well liked, & so nice. Much later on, ( if I recall correctly) they started to sell tortillas, which sure came in very handy, & saved a trip to the store! THEN,…. later, came cigarettes, and I might have been one of a few, but that was very convenient for me also. Sure do miss them, and ESPECIALLY those GREAT cream puffs!!!!!!! Wish they were still around!!!!!! So much of the BEST, is gone now, so unfortunately!!!!! SAD!!!! !